A Russian writer named Andrei Gorchakov is visiting Italy to research the life of Sosnovsky, a musician from his home country who studied in Bologna during the late 1700s. Andrei is accompanied by Eugenia, an Italian translator who seems to anticipate a relationship forming between the two of them. However, Andrei becomes more intent on understanding a lonely, deranged local man, Domenico, infamous in the community for previously locking himself and his family in their home for several years in fear of the end of the world. Andrei meets with this strange character who asks him to complete what he considers to be a very important task: carry a lit candle across the village spa. Bored and exasperated, Eugenia leaves for Rome to be with another man. Domenico also goes to Rome to make speeches and to stage a demonstration; he burns himself to death in the public square. Back at the spa, an ill Andrei delays his departure for Russia to fulfill Domenico's request. After much effort Andrei finally makes it across the drained pool with the candle where he collapses and, assumedly, dies. The last poetic shot shows him resting serenely in the Russian landscape of his home, all of which is contained within the large structure of an Italian cathedral. In his insightful book, Sculpting in Time, director Andrei Tarkovsky describes his desire to make a film about nostalgia, particularly the Russian variety which he considered to be especially acute. With Nostalghia being his first film made outside of the USSR, this longing for home was something the filmmaker was experiencing first-hand and, never returning to Russia, something with which he would continue to struggle. Reflecting these concerns in the homesick protagonist, the film works as a beautifully realized exploration of an alienated and depressed psyche, separated from what is familiar and beloved. However, it also goes beyond these specific issues to ask more universal and basic questions such as what is important in life and why we live the way we do. After all, this is a Tarkovsky film, made by a director who wants his camera to be a seeker of Truth rather than strictly a supplier of entertainment. This statement may set off warning bells for some viewers, and it should be noted that there are few purely narrative pleasures to be found in the slowly advancing plot. Yet Nostalghia remains a fascinating work because of the supreme visual sense of its images, the fundamental importance of its themes, and the masterful handling of its oneiric structure. The film aurally establishes the conditions for nostalgia almost immediately during the credits sequence. A black-and-white pastoral shot of the protagonist’s homeland is accompanied initially by solitary, haunting vocals, presumably Russian. This song is overlaid with and eventually drowned out by a selection from the Italian composer Verdi, suggesting the contact between the two different cultures that will be explored in the narrative. From this contact arises the conflict for Andrei between the new places he is visiting and the memories to which his mind continually returns. The cinematography clearly distinguishes those states by having the dreams or imaginings in black-and-white, ensuring that, for the most part, any rapid leaps from objective to subjective viewpoints are clear. An example occurs when the protagonist looks at the back of Eugenia’s head and is reminded of his wife in Russia, illustrated by a quick black-and-white shot of her also facing away from the camera. This constant longing for the people and places of his home is also reflected in the life story of Sosnovsky, the Russian composer Andrei is researching in Italy. Based on a historical figure, Sosnovsky garnered much respect and acclaim in Italy for his work, although he was only a serf in Russia. However, the bond to his homeland was so strong that he eventually returned there and later took his own life. The fact that Sosnovsky would face enslavement and even death because of his powerful nostalgia helps explain the protagonist’s depressed state of being—"I never go anywhere, I never see anyone". Andrei remains aloof around the hotel, not approaching others and speaking little to his pretty translator. In fact he is probably attracted to Eugenia, judging by her presence in one of his dreams, but can barely communicate with her, and she eventually gives up on him. The only person to which Andrei seems interested in talking is the disturbed Domenico, whose instability he considers to be a symptom of a great faith. When Andrei goes inside Domenico’s house to converse, there is an abstract sequence where the hero enters a room and finds what seems to be a miniature version of the Russian landscape about which he often dreams. It may suggest there is something in Domenico’s unusual asceticism that Andrei understands—a small piece of the familiar in a foreign land. Whatever common ground Andrei and Domenico share stems from their inability to comprehend or to fit in with Italian society. For the outsider Andrei, this is more easily explained, but Domenico’s seclusion relates more to his strong convictions and the eccentric behavior resulting from them. With his first appearance, the film begins to pose questions about his sanity and his beliefs and whether or not society is in a position to condemn him. As Domenico walks around the spa, quietly talking to his dog (similar to the one in Andrei’s visions) about how important it is to be different from others, some locals give different opinions about him. One man says he’s just crazy; another thinks he is afraid of everything. A woman considers him to be a man of great faith, an idea that Andrei seems to agree with most. Eugenia, however, in reference to Domenico, comments on the number of lunatics roaming Italy due to closed asylums and to the fact their families won’t care for them. These speculations are all probably correct in some way, although they perhaps reveal more about those speculating than Domenico’s true nature. It is one thing for him to roam around making grand and incoherent statements but quite another to (improbably) lock his family inside for seven years in fear of the world’s destruction. Clearly, he is not afraid to act on his convictions, regardless of their rebellious or bizarre nature; this is reinforced by his final, drastic decision at the conclusion. Domenico tells Andrei that people should try to have bigger ideas rather than always becoming distracted. He gives an example about asking for a cigarette when not knowing what else to say; one should learn "to not smoke, to do important things." Domenico feels the whole world needs to be saved, not just his family, particularly since we are all connected and one person’s actions can affect another. He illustrates this concept abstractly by telling Andrei that one drop of liquid plus another equals a bigger drop, not two (co-screenwriter Tonino Guerra also used this observation in Red Desert). The Russian listens to all of this with little reaction and says he will walk across the pool with the lit candle, although he initially has no intention of doing so. But as the film progresses, the connectedness of the two men is furthered to the point that Andrei dreams he is Domenico in a skillfully filmed sequence. During his final speech in Rome, Domenico talks about making radical change in one’s thoughts and lifestyle as well as returning to the simple foundations of life. He sees man as heading for destruction and shouts to the uninterested crowd that they should be ashamed that a madman has to tell them this. Although there is nothing new in his tirade, some truth can still be found in his words judging by the widespread culture of excess that exists today. In any case it is worth noting that Domenico recognizes himself as a "madman", indicating that he maintains some measure of sanity and making his self-immolation more meaningful and more disturbing. Although he is the most vocal and committed to his ideas, Domenico is not the only character concerned with significant issues. In the first color sequence, Andrei no longer wants to see the painting of the Madonna perhaps because it will only be an aesthetic response for him: "I want nothing more just for myself." He also utters, "that’s enough", a phrase repeated later by the other main characters that hints at a certain weariness—a sort of mental and spiritual exhaustion. One of the causes of this condition suggested by the film could be the difficulty or failure of communication that attempts to bring people together and help them understand one another. Domenico is cut off from society, alone and frightened, because of his inability to interact normally with society. Andrei discusses with Eugenia how poetry is untranslatable like all art and how people can’t really know each other until the frontiers between them are abolished. The miscommunication of Eugenia and Andrei’s awkward relationship provides a good example of these ideas. After her irrational behavior and angry verbal attack in his hotel room, she probably appears as unsound as Domenico to him, and vice versa. The argument concludes outside in the hall where some unusual Chinese music that another hotel resident is loudly playing can be heard in the background. This strange accompaniment again exemplifies the vast differences in cultures and personalities which are often difficult to comprehend and have led to the bitter deterioration of Andrei and Eugenia’s relationship. Although relatively minor, this relationship has nevertheless affected both parties somewhat strongly, and the main character’s heart condition can also be seen as a symbol of his sensitive nature. Andrei decides not to return to Russia at the scheduled time, possibly raising some political concerns for authorities, and resolves to perform the singular task asked of him by Domenico. Not feeling well and apparently deep in thought, Andrei waits for a driver and begins to smoke. But, after a pause, he throws the cigarette out of his mouth as if remembering what Domenico had said to him previously. The pool that Andrei is to cross has been mostly drained when he arrives, and workers are cleaning up various items off its floor. Some of these objects such as a bicycle with its front tire removed and various wine bottles have been seen earlier at Domenico’s; maybe he threw these things into the spa before he left for Rome. Maybe not, but the familiar items are probably intended to lend the setting a metaphorical resonance as an important culmination of the film’s themes. Andrei’s striking of his lighter to ignite the candle reminds one of Domenico’s similar, fateful motion on top of the statue. With failing health, the protagonist’s walk across the drained pool begins to seem like the most difficult and important thing he will ever do. It becomes the journey of life, made while trying to maintain faith and to keep the spiritual flame from being extinguished. When Andrei makes it to the other side, there is an ascending ladder he rests on momentarily before setting the candle down and collapsing. The final shot shows him at peace in the countryside of his home and inside an enormous Italian cathedral, a harmonious merging of what had previously divided him. By way of exploring the spiritual malaise in modern society, the film often presents a critical view of Western lifestyles. Actually, only a few of these points are specifically directed; most are of a more general nature, reflecting a certain pessimism about the state of the world. When Eugenia and Andrei have stopped to look at Francesca’s "Madonna of Childbirth", the translator mentions how she cried the first time she saw it. However, inside the church, she seems unmoved and is embarrassed when asked to kneel; the wonder and innocence of the past have, inevitably, disappeared. Later in the film, Eugenia claims to be a good translator who "even improves on the original." It appears that one who does so is sacrificing some of the truth with the embellishment or not exactly giving an accurate account of what is being said. Andrei’s drunken visit to some watery ruins provides some of the more direct comments about Italian society, vaguely suggesting it is too violent and commercialized: "There are too many Italian shoes…why does everyone buy them?" He tells all this to a girl who was playing in the area (who probably has no idea what he’s talking about) and goes on about the greatness of pure romances where "unspoken feelings are unforgettable." Maybe this is in reference to Eugenia’s angry departure, but it also corresponds with the film’s themes and with his previous comments by emphasizing the interior over the exterior—emotions over appearances. Andrei also tells a story about a man pulling another from a slimy pond, thinking he was saving him, only to find out that the person lives there. This might be a metaphor for Andrei’s longing to be back in Russia, a place probably looked down on by certain Western nations who, at that time, had greater freedom and better standards of living. But having these benefits does not mean that the responsibilities people have to one another should be neglected, and the scenes in Rome convey this idea. Eugenia’s man there, Vittorio, is not seen for very long, but the viewer gets the impression he is a callous individual. He completely ignores the people who show up to deliver something and seems disinterested in the beautiful Eugenia as well. Totally absorbed in his work, he briefly looks in her direction after she leaves to go buy cigarettes, the symbol from earlier that represents a yielding to unimportance and pointlessness. The most extreme display of human indifference can be observed in the onlookers at Domenico’s suicide who stand posed and unmoved; his dog is one of the only ones who shows concern. One woman is even putting on lipstick during this event, and most of the people appear to be as rigidly cold as the statues described in Sosnovsky’s letter, read earlier and describing the lack of freedom in Russia. This comparison suggests that living in a nation of significant personal and political liberty does not necessarily make a person "free"—there are internal barriers as well. The film’s shifting portrayal of Eugenia is not always flattering but is probably better described as ambiguous. Because of the personal nature of the director’s work, it is perhaps unavoidable that the female character remains more perplexing and her motivations are less clear. She also partially exists as an example of the self-centeredness and lack of faith in present-day culture. The devout women in the church serve as contrast and are given a reverential, mystical respect; Eugenia doesn’t understand them and asks the sacristan about their devotion. This self-proclaimed "simple man" thinks women should raise their children with patience and self-sacrifice…and is not sure what else they’re supposed to do. If this implication is part of the film’s plea for a return to the foundations of society, then, on the topic of women’s roles, it has gone a bit too far; society’s advancements can’t be all bad. The scene of Eugenia falling down and laughing in the hall of the hotel builds on her somewhat incomprehensible nature. The protagonist may pity his translator as a troubled, confused person, indicated by a dream in which his wife comforts a tearful Eugenia. Also, when she begins criticizing Andrei for being full of complexes and unable to appreciate freedom, she is looking into a mirror and possibly implicating herself as the unhappy one. During this rant Eugenia acts absurdly (for instance, exposing her breast) yet makes a few interesting comments such as wanting to sleep for ten days to forget Andrei although "maybe there’s nothing to wipe out because you don’t exist." Her whole scene began when Andrei mentioned Domenico, as if his obsessive idealism is an affront to her practical egoism. So Eugenia leaves to be with "her man" Vittorio, who is from a distinguished family and who doesn’t even seem to notice she is there; the two are never shown together in a shot. Eugenia is at her most beautiful in these scenes, and her self-deceiving situation evokes sympathy in that she thinks she will be happy going away with this lifeless individual. Eugenia arrives at the plaza to witness Domenico’s final act, and there is a brief shot of her looking on in horror, one of the only people who appears affected by this tragedy. It would be remiss to write about a Tarkovsky film and not mention the characteristic painterly imagery and poetic style. The very first shot sets the tone with its idyllic Russian countryside that includes some of his visual motifs: a horse, a dog, water, trees, nature in toto. Next is seen a misty, lush Italian landscape being intruded upon by a Volkswagen that somehow seems out of place—something of man’s design in the context of the natural environment. The many alternations between reality and dreams are handled expertly and in different ways. In one scene the sound of Andrei’s remembrances are heard before the beautifully photographed black-and-white pictures in his mind are revealed to the viewer. A similar poetic sequence is bracketed by Andrei and his wife hearing each other’s voices in spite of their physical separation. Correspondingly, even when in the same room, he can barely communicate with Eugenia because of their emotional and spiritual distance. Another tableau-like shot handles the transition between realities with a long take as Andrei rests in his empty hotel room after wearily exploring it and begins to dream. Suddenly, his dog from home magically walks in from the other room and lies down by his side. The effectiveness of this sequence may partially stem from its adept understanding of the logic of dreams—often a mixture of things from the past with slightly altered things of the present. 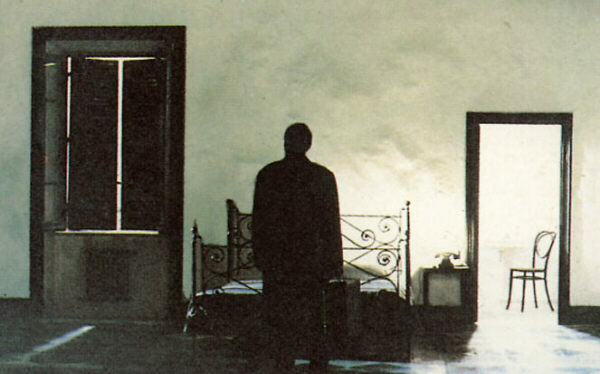 For instance, the dream continues by showing Andrei’s wife lying alone in his current hotel bed, but the bed is now perpendicular to its actual position in the room. Domenico’s flooded abode provides a fascinating locale for the camera to investigate. It is here where Tarkovsky uses one of his trademark shots in which the camera begins to track left with the character at the right of frame. The character disappears from view momentarily only to enter from left of frame as the camera continues its track; it’s a disorientating technique that appears to have magically transported the subject from one spot to another. In Domenico’s house the camera focuses on translucent green and brown bottles that are splashed by falling water. How this type of visual haiku becomes so memorable is unclear (cinematographer Giuseppe Lanci deserves a mention), but simple shots such as this one take on a certain beauty and resonance that is unusual. The ruins and stream where Andrei is shown drinking present more natural scenic material with the crystal clear waters and surrounding vegetation. Even some of the rocks and debris under the water take on a pleasing greenish-blue tint; after all, as Andrei notes, "Here it’s like in Russia." Running through all of Tarkovsky’s films are certain recurring forms, as if his entire body of work is connected as much in the details as in the larger themes. The opening color shot focuses on a solitary tree in the landscape, reminiscent of the important symbol that opens and closes The Sacrifice. The beautiful tracking through the trees at the end of Mirror is recalled near this film’s beginning as the camera slowly moves around the church pillars. A circular mirror in the hotel bathroom corresponds to the portholes in the Solaris space station. Also, the protagonists of Stalker and Solaris both have a discolored patch of hair similar to Andrei’s. Throughout his career Tarkovsky returned to subjects concerned with mankind’s role in the larger scheme of things. Nostalghia is a film that challenges the way we live our lives and calls for changes to be made in them, like Kurosawa’s Ikiru. It is also a dreamlike work of film poetry that masterfully expresses a longing for all that makes up one’s conception of home.